I make some GURPS content from time to time, and it takes me a long time to make it. So, since it takes me a long time to do that, I thought I'd start a blog so that my GURPS stuff would exist for all eternity. I plan on posting assets, conversations about complicated rules, session recaps, etc. I dunno if this will be useful to anyone, or only useful to myself, but here we go. The most boring thing. There is nothing more to say. Immunity to sound based attacks... literally the Protected Hearing advantage. Take a few more levels if you like to increase damage further, probably 3d is a good max. Take up to 6 levels, this gives a bonus for a minute after using. Lowers foe's special attack. If we define Offensive Will with magic as well as 2.5/level, -2 Offensive Will is a +5% enhancement to an affliction. Full Cost: 28 points for level 1. 5 points/level thereafter. Casting Roll: None, use Innate Attack to aim. The "caster" creates an unsettling vibration in the air. Everyone in range rolls a contest of will, or has "Offensive" will reduced by 2 for 3 minutes. An attack that increases one's special power after using it. Full Cost: 58 points for level 1. 10.5 points/level thereafter. The "caster" shoots a charged beam at an opponent doing damage, and increasing her own attack to further do additional damage in the future. Each time this ability is used, the bonus to will for the purpose of malediction attacks is further empowered by +1. Notes: I decided to lower the price by 1 point by making the 0.5 points of both advantage add up to 1 instead of rounding up both parts. An appropriate max damage will be 4d+2, or 97 points. Creates a barrier that protects against Special Attacks. We might do this with Magic Resistance with the Ranged and Wall Enhancements. The "caster" shoots a 6 yard long wall that lasts for 10 seconds. This wall affects all offensive magic except for that which benefits the caster. This acts as Magic Resistance for anyone that keeps the wall between an antagonistic caster to the original caster and themselves. Notes: If you take ten levels, you save a point! For every 1 point of damage received by the holder of this ability, the attacker receives two of the same type. This is still protected by other types of DR of both parties. Take as many levels as you want, but it might get a little broken. Add Costs FP per second and Reflexive to make it more like the pokemon ability. 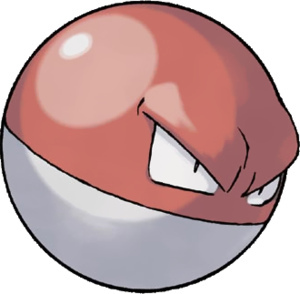 I don't like voltorb, but a few of those moves were interesting I think. I like Mirror Coat and Light Screen especially. Set Adrift, On 3d6 – A brief look into my life through GURPS.